For at least half of my life, I have been a person with more than one place that I called home….. while it may seem weird to some people, to me, that is a great reason to be thankful! Not because it has meant spending half of my life away from the hometown for generations of my family, but as I mentioned in an earlier post, I am thankful for the ability to pursue the career I want without having to give up my family’s hometown of Memphis. With generations of my family having been born and raised in Memphis, it is the place I have ALWAYS called home. My mom was raised there, raised me there and still lives there. That is in and of itself, enough said! All my formative years were spent there. 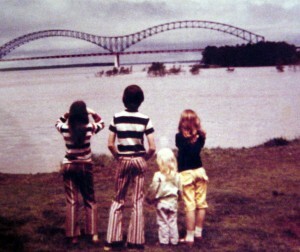 Whether it was kindergarten or high school, it was in Memphis. Most of the big celebrations have been in Memphis — sweet 16, high school & grad school graduation, so many weddings, baptisms, bar mitzvahs, etc. The food I crave…most of it is from there like Memphis barbecue (Central BBQ if I need to be more specific, thought the drive through version of Tops will help in a pinch and there are several other places that I am glad to go as well!) and Broadway Pizza! I remember when I was in college, the first time I went back to Memphis for a summer…. there was this weird feeling of missing my college home. And yet, I knew I was at home. I felt like I was at home. And yet, I was also missing home. That was when I first realized that I had been able to create a great sense of home hundreds of miles away from the only place I’d called home before. It was a bit confusing and yet, for me made perfect sense. It still does as I’m writing this from my home in St. Louis and yet I miss my home in Memphis. College was the easiest place to make a new home. When I moved back to Memphis from grad school, I already knew that it wouldn’t be the same again. But at the same time, it seemed to work for me to have two homes and so I was ready to move once I finished school. After moving several times to different cities, I learned how to cultivate a sense of home. With St. Louis, it certainly helped that I came up here to work for a week or so each month for several years. I had a chance to get to know the area, reconnect with college friends, follow local sports & events as well as become closer friends with several people at the office. One of the things I learned along the way was that making another place home takes investing time to that objective. So for me, I wanted to be sure I met new people in St. Louis too. I started there and have built some great friendships here, have really gotten to know and love St. Louis. And I have found so many things that show it has become home. My house is there and it holds so many “things that are important to me. Christmas tree ornament my mom & grandmom made, the kilim I negotiated for when on vacation, my favorite flannel pajamas and that general sense of place. I’ve had some great times since arriving in St. Louis! Hosting lots of family and friends here, getting to some great concerts & experiences (don’t forget Pink and the City Museum! ), and celebrating two World Series’ berths and one resulted in a win! 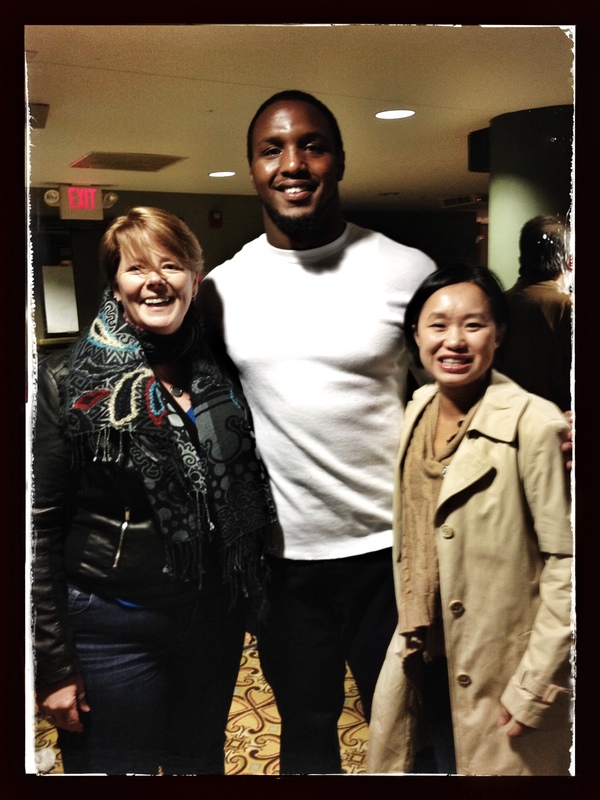 And the picture here on the right is this weekend as a friend and I met St. Louis Rams defensive end Robert Quinn! The food… well I have found some pretty great food experiences here. There are these specific chips…. made of wontons and crazy yummy that I crave… And there is this deep dish pizza that is simply amazing at this hole in the wall sort of place. And just tonight I had this seafood stew that was a little like a paella but different… and wow. I’ll be dreaming of that for a while! The clothing has started as I’m getting more and more red into my wardrobe….. some of it even touts the Cardinals. And I have a Blues shirt too these days. And you know how many places the St Louis Cardinals water jug goes with me! Being able to create a sense of home somewhere other than where I grew up, where none of my family lives…. that takes several factors coming together. I’m thankful they have come together for me here in St Louis in a way that lets me appreciate my new home and old one too! Thankful for the friends who help me enjoy my new home! « Thankful for Funny Pictures & Movies — Oh, and Motivation from Office Space!